I know this post is a few days late but the British festivities of the bank holiday weekend distracted me completely! These are the products that I wore this month I thought I would do another of these post like last months as it means I switch my products up more and everything has changed this month besides my mascara. 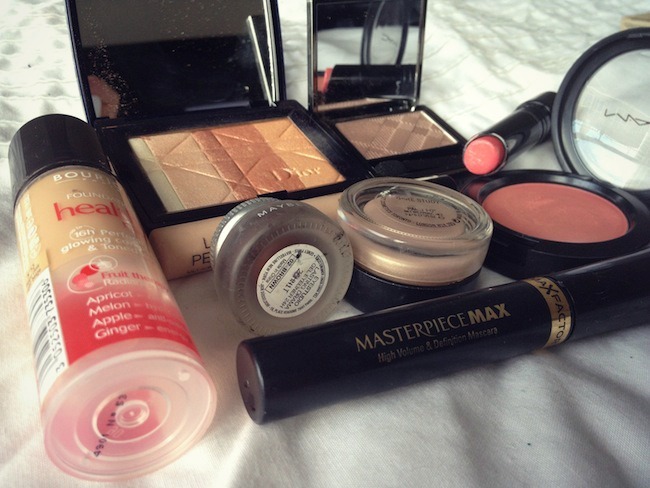 While we had our one hot week I did only wear foundation, mascara, blush and a sheer lipstick but otherwise I have grabbed these products nearly every day for the month of May. You may notice that I am missing bronzer this month and that is because I have been testing out the fake tan waters more and also after our heatwave I caught a nice colour on my face and bronzer was not needed! Bourjois healthy mix foundation shade 53 - I love this foundation so much I will go as far as saying this is the best high street foundation I have tried. It reminds me of my Chanel Vitalumiere aqua foundation but this is slightly better coverage. It lasts me about 12 hours so I highly recommend it! Collection 2000 concealer in light - Another new product this month for me and my first concealer! I see why this is raved about so much in the beauty community it does wonders! Mac Paint Point in Bare Study - I use this as an eyeshadow base. Burberry eyeshadow in Rosewood- Love this eyeshadow it is such a gorgeous light taupe colour, I now favor this eyeshadow over Mac's Satin Taupe. I have done a full review here. Maybelline Brown gel liner - Such a great eyeliner and so easy to use. It doesn't smudge and the brown liner is less harsh than black for the summer, I really recommend this eyeliner! Mac Blusher in Something Special - My first ever creme blusher, lovely natural colour full review here. Dior Amber Diamonds - It is now secret how much I love this highlighter, gives a gorgeous natural glow full review here. Mac Sheen supreme lipstick in Blossom Culture - I got this for my birthday and it has been on my lips every since. A lovely peachy colour, which is sheer and glossy, I will do a full review on this soon! So have any of the products mentioned been your favourites for this month? What did you wear foundation wise in the heatwave? 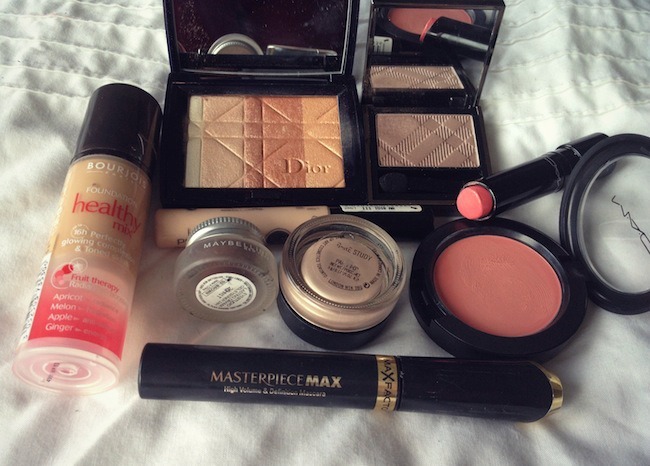 The Dior highlighter looks beautiful, as does the Mac lipstick. Impressed to hear that the Bourjois foundation is so good, it's nice when the highstreet brands get it right with a product that we often have to spend so much money on!